Equine Muscle Maintenance utilizes state of the art, time tested, and proven protocols combining Equine Photobiostimulation (Laser) Therapy with many other modalities to treat common problems with muscles, tendons, ligaments, and nerves. See Therapy Services. All of these conditions have one common factor: they are often a result of fatigued muscles. Fatigued muscles occur from everyday training, over training, lack of recovery time, and racing a horse fit when muscles haven’t been conditioned properly. To be successful in the racing game, horses need to stay in training and hold up to the rigors of daily conditioning and competition. Soundness is everything! Soundness supersedes training, training methods, supplements and so on. A sound horse is like a blank canvas, and training is the color pallet in which a trainer can transform that canvas into a beautiful work of art! An unsound horse is limited in training, kind of like trying to paint with only a few colors. That might be fine in a specific situation but it will never be a complete work of art or a masterpiece. Just because a horse does not exhibit blatant or conventional signs of lameness does not mean that its musculoskeletal system is not compromised or that dysfunction doesn’t exist. Fatigued muscles cause: pulls and tears (acute conditions), micro-trauma (accumulation of small tears), and hypoxia (deprivation of adequate oxygen supply). 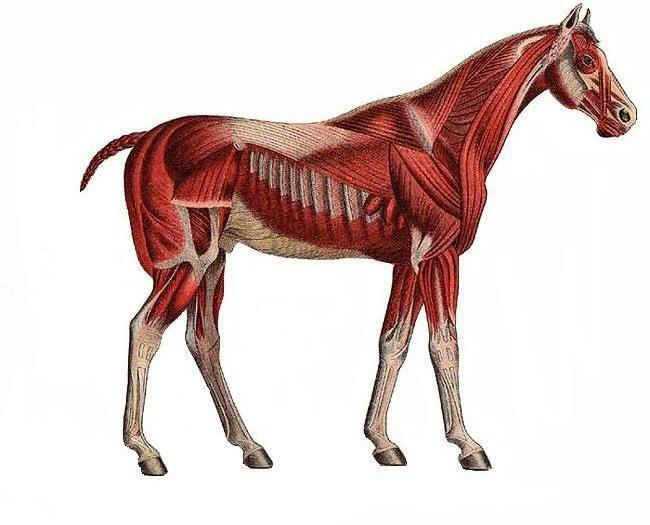 Each of these factors can cause an Equine Athlete’s body to produce tough, dense scar tissue in the affected area or in a quadruped’s case, multiple areas. This scar tissue binds up, ties down, and glues tissues that need to move freely. As scar tissue builds up, gait is affected; muscles become shorter and weaker, tension on tendons causes’ tendonitis, impinged nerves, and a multitude of other ailments. This causes reduced range of motion, loss of strength, and most importantly pain. I stress “most importantly” because unless pain is involved, we never consider or bother with the other adverse effects and miss vital telltale signs that something is wrong. Unless you have the knowledge to know what you are looking for and the experience to fix what you find, how will you know when you’ve reached homeostasis? When I attack a certain problem or ailment, I anticipate what the result will be and to what extent it will improve performance. When I am given the time to rehab, maintain and build up a horse’s body leading up to a race, I truly believe that the horse can’t lose! This confidence comes from experience, faith in my abilities, and years of producing results. More importantly, you must be able to develop a very advanced “feel” for tissue, texture, and how it affects a racehorse’s movement. Understanding and evaluating movement of tissue, is an absolute value unto itself. The basic premise of what I do looks simple, unfortunately it’s not that easy and the results achieved are not typical. See Specialty Services and Client Success. Horses are assessed and kept on various programs depending on the Equine Athlete’s somatic condition or campaign goals. The treatments and modalities used are grounded in science, but the interaction with the horse and its body is artistic in nature, kind of like a dance. Buying a laser or a therapeutic machine does not help you in developing a feel for what the horse’s body is telling you, that takes time and experience. Other therapists and barns that have acquired their own laser systems eventually figure this out and still request my services and advice because they cannot produce the same results. Anyone can buy a musical instrument; unfortunately playing it at an expert level is a whole different story. For those that want to save money and buy their own Laser, I suggest hiring a professional, it will cost you less in the long run, you’ll quickly reap the rewards, and ultimately your horse will thank you for it! With the advent of tougher drug policies and a ban on steroids, it’s going to take more work to keep Equine Athletes sound, training forwardly and performing at a consistent level. That will be covered in next month’s blog: PREVENTION & MAINTENANCE!